SAARBRUECKEN, GERMANY — This week I’m observing the final days of the German federal election campaign that will wrap up when the polls close Sunday evening, September 24 — Election Day in the European Union’s most populous nation. Chancellor Angela Merkel’s CDU party with its Bavarian CSU counterpart is currently projected to again win the largest single block in the Bundestag, and that’s good news. The real drama involves which of the smaller parties will place third, thus giving shape to the governing coalition that will follow. Under the leadership of Merkel’s CDU/CSU, Germany’s economy is booming, it’s running a strong trade surplus, and its financial heft has helped to stabilize other parts of the European Union during the recent financial crisis. In the American media, some conservatives have given Chancellor Merkel a hard time over the number of refugees the country has admitted over the last two years. I disagree with these critics. One has to look at German refugee policy from the standpoint that Germany itself is a country which has generated its share of refugees over the last century. If the German government wants to be particularly generous when admitting refugees from other countries, that’s their domestic concern. I’m concerned with American national interests that are impacted by German defense and foreign policy much more than how it handles refugees. Specifically, Germany plays a a critical and stabilizing role in Europe as a key member of NATO. Chancellor Merkel has pledged to increase Germany’s defense spending from 1.2% to 2.0% of GDP — the spending target set by NATO members to meet current challenges. Merkel’s opponents on both the left and the radical right are super weak on NATO: the socialist SPD party rejects the 2% spending target for defense, while the radical right AfD wants Germany out of NATO and all US military forces out of Europe. NATO and the transatlantic relationship will both be stronger with Merkel in the Chancellery for another term. No other party competing in the German election is nearly as strong on NATO or the transatlantic relationship. Political campaigns continue to evolve on both sides of the Atlantic. Here in Germany, the emphasis has shifted toward a much greater emphasis on door to door and in person voter contact driven by a serious data operation. 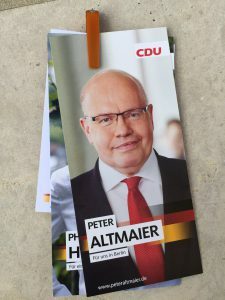 CDU and CSU campaign volunteers continue to fan out across German neighborhoods across the country mobilizing voters the party has determined are most likely to support its candidates. Europe’s privacy/data protection laws make targeting individual voters more difficult than in the United States, so voter mobilization efforts are targeted at neighborhoods as opposed to households. The point is the same: digital technologies help to determine where the party concentrates resources, but the premium voter contact is analog — in person. Campaign rallies continue to drive much of the earned media for all parties — I attended a rally featuring Chancellor Merkel in the southern German city of Freiburg on Monday. New in this cycle is the presence of a handful of noisy protestors at each rally attempting to draw a level of media attention disproportionate to their tiny level of public support. Social media impacts how conventional campaign rallies are held, with a premium on generating social media coverage, not just evening news coverage. Most the people I saw at the rally were taking pictures and video and uploading them on the spot from their phones. As someone particularly interested in the strategies and tactics of effective campaigning for conservatives, I’m most encouraged by the shift in emphasis toward connecting with voters in person. Social media, data and digital technologies have driven much of the news coverage of how campaigns are waged, but the pros who study what works and what doesn’t have come to the same conclusion we drew in San Diego County in 2002: in person contact is critical to connecting and motivating voters. It’s not merely the number of times a voter is contacted, but there is a serious qualitative difference between a personal visit and an utterly ineffective phone call. In this sense, the CDU’s work validates the impact of personal contact that we have seen on our side of the Atlantic. On Sunday, we’ll be able to judge the effectiveness of thee CDU/CSU campaign as the results come in. Ron Nehring served as Chairman of the California Republican Party from 2007 to 2011, Chairman of the Republican Party of San Diego County from 2001 to 2007, and was the 2014 Republican nominee for Lt. Governor of California. This entry was posted on Wednesday, September 20th, 2017 at 3:51 pm and is filed under Blog Posts.